Victorian Red Cross VAD Louie Riggall. As we observe the centenary of the First World War, there are numerous exhibitions, publications and events timed to mark this milestone and acknowledge the many ways Victorians were involved in supporting the war effort. There will be two exhibitions at Melbourne Museum. ‘WWI: Love and Sorrow’ will run for four years, echoing the length of the conflict. The war is recalled through the experiences of eight people including a mother awaiting the return of her son, brothers fighting on the Western Front and a Jewish German soldier. The ‘WWI Centenary Exhibition – The war that changed the world’ will present 350 of the most historical artefacts from the Imperial War Museums in London from 18 April to 4 October 2018. Bookings essential – visit 221exhibition.com.au for further information and tickets. ‘Australia Will Be There’ is a touring exhibition from the Shrine of Remembrance in Melbourne which was opened in August 2014, with its first regional stop at the East Gippsland Art Gallery in Bairnsdale. It opens in Mildura on 23 February and visits another dozen galleries over the next four years. See Travelling exhibitions at www.shrine.org.au/Exhibitions or our events calendar for future venues. At the State Library of Victoria, part of the Dome Galleries ‘Changing Face of Victoria’ includes a WW1 Centenary display of letters, diaries, images and maps, as well as an audio-visual presentation of personal stories of the Great War. Open 10 am – 5 pm daily. 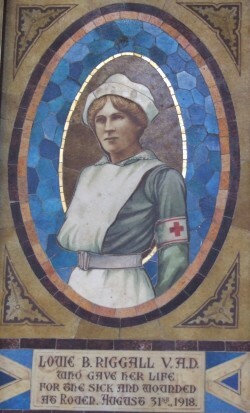 Nine days after the declaration of war, the Australian branch of the British Red Cross Society was formed at Melbourne’s Government House (then home to the Governor-General before the establishment of Canberra). Lady Helen Munro Ferguson, wife of the Governor General, provided the ballroom of Government House for Red Cross activities. As well as knitting and sewing goods, making up care packages and providing transport for returning and injured soldiers, Red Cross volunteers also served overseas providing facilities and a wide range of services for the injured. The Heritage Council of Victoria has developed a walking tour of significant Melbourne sites linked to the war which will be released soon.